I admit it: I'm lazy when it comes to marking sew-and-flip triangle corners. 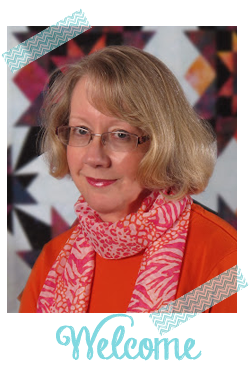 Bonnie Hunter carefully draws a diagonal line before stitching to make triangle corners on squares or rectangles. I use a line drawn on my sewing machine bed to line up the corners, and hope for the best. Until now . . . . 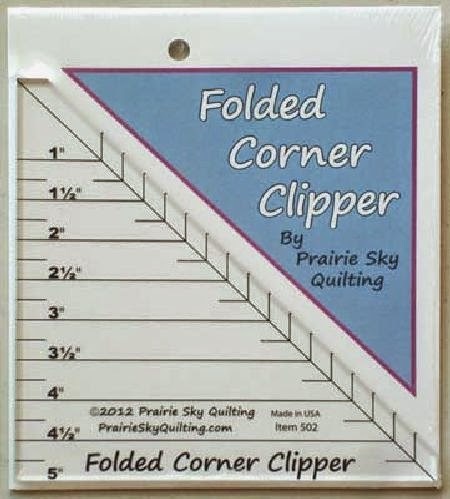 I came across the "Folded Corner Clipper" while at Quilt Wyoming last summer. I didn't really use it until I started my next Jelly Roll Party quilt, Drop Diamonds (see yesterday's Design Wall Monday). It requires lots of sew-and-flip corners, so I pulled out this little tool and tested it out. I am pleased to report, this is a tool that is absolutely worth the $14 price tag! 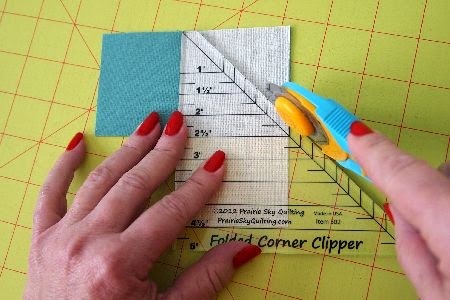 To use the tool, you simply place the tool on the corner, and trim.The marks line up with the width of the strip or square being sewn. I'm using 2.5" strips for this quilt. The only trick is to be sure you're trimming the correct direction. The Drop Diamonds pattern has illustrations that make it clear which direction the seam needs to be sewn. 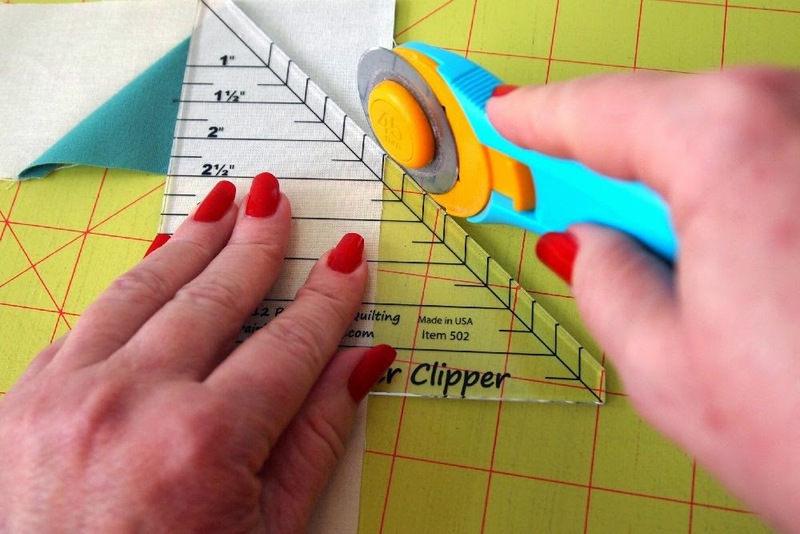 I'll be using this tool for sew-and-flip triangles from now on! 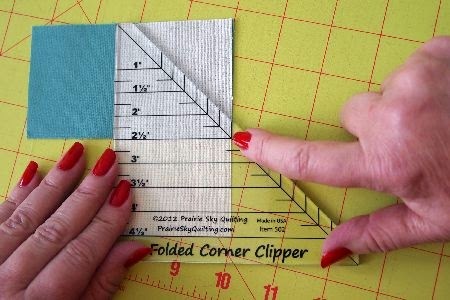 I bought my Folded Corner Clipper from Two Sisters Quilting. You may also view a video on how to use the tool here. Prairie Sky Quilting has online instruction here. The tool is also available from Prairie Sky Quilting. It's always nice to be able to recommend a new tool. 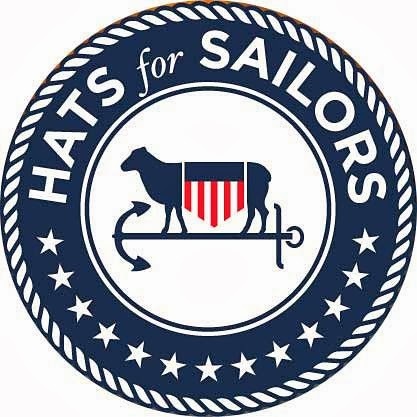 This is one I can recommend. The finished quilt will be featured on the March 6 blog post. Come back to see! That's a good idea! I have a similar ruler but didn't think to use it that way. Thanks for the hint! I just bought one of these too, tried it yesterday and LOVE it! My current piecing project is a jellyroll quilt and getting corners right with the pinked edges was a headache before I found this tool. Such a time saver too. Wow....that is a great idea!! I think it is going to be on my wish list. You wonder why this ruler hadn't been thought of decades ago. Glad someone decided to market it and that you gave a nice review on it too. Wow that is a cool little ruler! I wonder about stitching after the cut with the possiblity of the bias stretching. I think if I was using this particular ruler, I would STARCH STARCH STARCH before I cut the first piece of fabric. Thanks for your review. What are you doing with your "left over" triangles?? ?